Pattern and Match: Do Animals Climb Towers? You have undoubtedly read about or seen the raccoon that recently climbed a 25-storey building in Minnesota. To a human it seems kind of cute and interesting, along with some worry about the welfare of the animal. To the raccoon it would have been more about survival and not much fun at all. Being a ham this immediately brings to mind the question of whether animals climb towers. Yes, they do. This I know from direct experience. Like the raccoon in the story animals don't usually climb for fun (or to work on antennas!) but rather to accomplish some goal related to survival such as shelter or food. I have seen squirrels climb for no discernible reason at all, but that's about what we expect of squirrels. The only regular animal climbers I have seen on my towers are raccoons and squirrels. The why and how of it are interesting. At my Ottawa QTH where I had two small towers I had frequent opportunities to witness these climbers. Unfortunately I have to relate the rest of the story without pictures since they never waited for me to find a camera and then pose, and in any case would disappear fast when they caught sight of me sneaking up on them with camera in hand. Instead I'll include pictures of the towers and explain the rest in words. The tower pictures are taken from blog articles back in 2014. Rodents rely on their claws to climb. On trees this works well; on steel the claws are useless. Larger animals can grip tower braces with their paws. 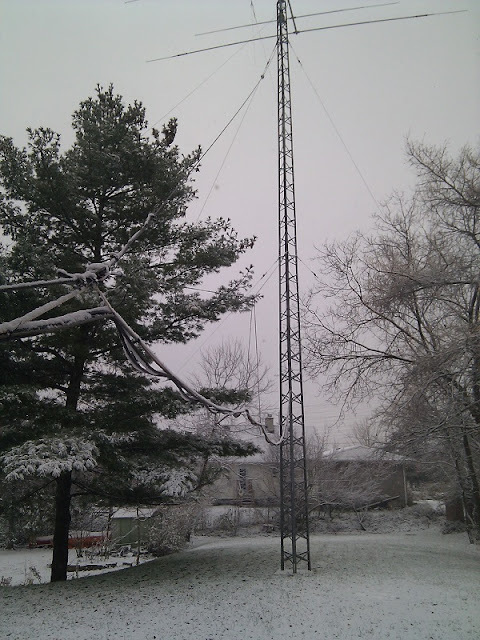 The first time I caught a squirrel climbing was on my DMX tower -- this tower is now the driven element of my 80 meter vertical yagi. The first few times I noticed that the squirrel would hop onto a bottom brace and sit there. Then it would hop off and continue on doing whatever it is that squirrels do. Days later I saw one (the same one?) jump from the lower brace to the next higher one on another faces. Finally one of the brighter ones realized that this thing could be climbed and made it up to about 20' in this fashion, then immediately come down again. It was interested to observe their learning process. During one of these episodes a second squirrel on the ground watched the one that was climbing and decided to try it. Its first attempts failed, seemingly unable to catch on to the trick of it. When it finally succeeded the two squirrels chased each other up and down the tower the same way you see them playing on trees. After 30 seconds of this they were back to chasing each other on the ground. I never caught a raccoon climbing the DMX tower. Perhaps they didn't, however it is very exposed and raccoons are shy and mostly nocturnal. I never saw a squirrel climbing in winter. Whether it was a behavioural thing or the tower steel was too cold for comfort I can't say. Apart from play animals can find towers useful. Actually play is useful for improving and demonstrating fitness and is common behaviour among most animals, humans included. Perhaps the most common use of towers by animals is getting from A to B; that is, it's a kind of road. The location of the tower is therefore of utmost relevance to whether it will be attractive for climbing. In the case of the DMX tower it was eyed by the squirrels as a bridge between trees. Not visible in the earlier picture is an huge though diseased willow tree on the left since it had just been cut down by my neighbours to prevent it falling down. The reach of its branches was ideal for squirrels, allowing them to jump to or from the branches of other trees. With the willow gone the tower was being eyed as a replacement to cross my yard without touching the ground. It didn't work out, though they did try. One day I watched a squirrel climb to over 30' on the DMX tower and attempt to jump to the spruce on the left. Since the squirrel could not dig in its claws it had to attempt the jump from a sitting position on the brace rather than its preferred method of digging in its hind claws, leaning outward and pushing. It couldn't get enough purchase on the steel to make it work. Luckily it only fell partway, landing on a lower and longer branch. The bracketed tower was far more useful for animal transportation. With no trees overhanging the house the tower was an easy path to the roof and from there to the overhead telephone and power lines. Utility poles and lines form a transportation network for rodents. Indeed this tower was in use long before they learned to climb the DMX since it is so obviously useful and its braces are comfortably horizontal. This is where the raccoon comes in. One morning I walked into my home office -- a converted bedroom whose window you see in the picture -- and came face to face with a raccoon. It was heading down the tower and its head was level with mine. Both of us were caught by surprise. After staring at each other for a moment it reversed direction and hopped back onto the roof and sped away. That's one picture I most regret missing and I never again caught a raccoon in the act of climbing. The only trouble it appeared to have with the tower was its size as it squirmed between and around the tower legs and braces. The only other animal of note, other than birds, was a lone groundhog that stood up with its front paws on the lowest brace of the DMX tower to have a look around. Like many rodents groundhogs can climb, though not very well and may resort to it only when they have no other means of escaping a predator. At my current QTH none of my towers is useful to animals and I have not seen any attempt climbing. This is not unexpected. The bracketed tower only gives access to the roof, which is steel and unfriendly to claws. There are no trees to jump to. The Trylon likewise has little utility since the adjacent trees are short and isolated from other trees. The big tower is in the middle of the hay field is even less useful to animals. Though unlikely perhaps one day I'll catch a squirrel climbing a tower if only for play. But with so many trees compared to suburban lots I doubt that towers hold the slightest attraction for them.